I recently started a log called, “What I learned during this project.” What was the inspiration for such a file? I suspect there are three kinds of woodworkers when it comes to mistakes: those who make a few, those who make a lot (yours truly) and liars. I was assembling the stool pictured below when I realized that not only had I swapped the left and right legs, I had the middle panel in backwards, too. At least the top was on top! Fortunately, the legs’ thicknesses were within 1/64″ of each other. Still, I had cut the mortises using relative dimensioning, a slightly narrower mortise for the slightly thinner board. Since the whole leg was the tenon, there was no shoulder to cover imperfections in the mortises. As Popeye once said, “All’s well that ends in the well.” While one leg was a little tight and the other was quite loose, you can see that there isn’t enough difference to even detect in the photo. Distractions caused me to switch positions on these project components. Lesson learned. 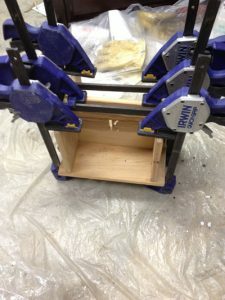 By the time I realized my mistake glue and clamps had been mobilized, and there was no way I was going to try to take anything apart. In the heat and humidity of South Mississippi, chemical reactions happen very rapidly. While it may take hours before glue is cured, only seconds need pass to prevent repositioned parts from being reseated in their intended locations. 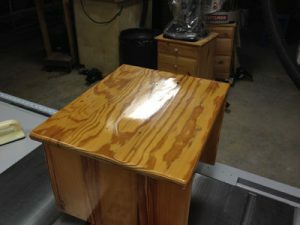 A while back I wrote about watching television during mindless tasks like sanding. Now, I believe I’ve let that practice bleed over into duties that require more of my attention. Listening to a podcast, I was paying so much attention to what the participants were saying that I totally spaced out on the simple task I was doing. How much easier, then, to slip up and make a mistake on a project? I’ve resolved to limit podcasts and videos to truly mindless tasks, like sanding. For 150-year-old pine this child’s stool project must be OK, as its recipient likes it. 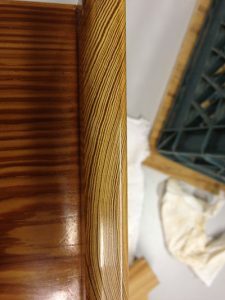 My favorite part of this old, old pine: the end grain finishes so beautifully. Another resolution I made: Use painter’s tape to identify pieces. On this project pencil marks on the ends of tenons and inside mortises specified location and direction. Chalk on the large area of a panel denoted left and right. For me, the chalk rubbed off too easily. And, the pencil instructions were on parts that were hidden during dry as well as glue-up assembly. IDs written on 2″ pieces of tape will be nearly foolproof, helping to minimize mistakes. We encourage your comments below. How do you avoid mistakes in your projects? For the last 6 weeks when I go to the DR. I am greeted by good afternoon “hand burger” 3 plus hrs in surgery to repair a left thumb, that got too close to a fast moving table saw blade–all because I turned my head to get the push stick off the work bench and pushed my thumb into the blade.===it only takes a second. Well I have a nice big Radial arm saw, with a 72 tooth blade on it. When the saw is running at about 3400 RPM’s it’s really no place to put a finger or hand. I once tried to figure out how many teeth would pass into skin and bone before your mind would react. I think the number would be headed to a million, by the time your mind tells you that something is really wrong. Safety has got to be the biggest issue in a shop. Hope your all better by the time you see this Pat. Yes, distractions, like the voices in my head discussing other than the current project, cause errors. This gets worse with fatigue and lateness of the day. If I must flip a switch to see outside, there is NO flipping switches on power tools in the shop. Layouts and calculating dimensions and likewise suspect. Sharpening, cleanup, pickup and put away are all fair game. So helpful post. Thanks for covering the grate info.